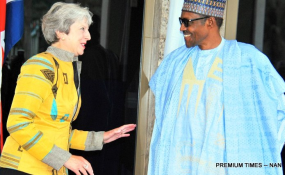 British Prime Minister, Theresa May has said she was in Nigeria to bring jobs and enhance treading links between Nigeria and Britain. Theresa May lands in Abuja, Nigeria to discuss trade and security as part of her three-day trip to Africa. While in Nigeria Theresa May,at FMDQ Security Exchange building, Victoria Island, Lagos, had a meeting with the Nigerian business community. The prime minister, accompanied by members of her trade delegation, met with Alhaji Aliko Dangote, Mr Femi Otedola and Mr Tony Elumelu, among others, who had earlier assembled at the venue. The meeting which last for 40 minutes, provided an opportunity for forging more bilateral relations between Nigeria and the United Kingdom. May had earlier on Wednesday afternoon met with President Muhammadu Buhari in Abuja where Nigeria and Britain signed agreements on Defence and Security partnership, among others. May's visit to Nigeria is part of her tour of three African countries. The prime minister also met Gov. Akinwunmi Ambode of Lagos State, accompanied by his deputy, among other state officials, who received her at the Lagos airport. The business community in Lagos says the visit of British Prime Minister, Theresa May, will deepen existing bilateral relationship between the two countries. Some members of the Lagos business community expressed their views on the sideline of the British Prime Minister's meeting with the business community in Lagos on Wednesday. Mr Akin Olawore, the President of Nigerian-British Chamber of Commerce (NBCC), said that the meeting was pertinent for Nigeria to maintain a strong economic relationship with Britain in alignment with its membership of the Commonwealth. "It seems very convincing now that Britain wants to explore trade with Nigeria and we are also ready to do business with them. "We are supposed to be natural business partners because we have so many things in common. "But I believe this visit is setting a tone for partnership because we can now work together and see how we can help each other achieve real trade growth. "Now that they are ready for serious business with Nigeria, genuine business people can take advantage of the opportunities," he said. Olawore said that the proposed Investment Cooperation Agreement (TICA) between the two countries would enhance trade competitiveness, economic growth and ease of the business climate in the country. "If you look at our agric export, for lack of meeting their standard or European Union standard, they were stopped at the port, but now that will not happen again. "Instead of stopping it at the ports, they will come and work with us here to ensure that the standard is what they expecectd it to be which is how partnerships work, you do not wait till the person make mistakes, but you work together to achieve mutual growth,"he said. He said that trade betwen Britain and Nigeria was expected to rise above 100 million pounds before the end of 2018 and could hit $8 billion by 2020. Mr Babatunde Ruwase, the President, Lagos Chamber of Commerce and Industry (LCCI), said that the business community should position itself to explore the various opportunities and maximise the benefits of the mutual partnership. "It is a good development for Nigeria and British relationship because we can see enthusiasm that came from the Prime Minister's visit and her planned investment in certain sectors of the economy. "Particularly, their interest in the areas of improving investment in Fintech and infrastructure development," he said. Nigeria is Britain's second largest trading partner in Africa. Nigeria's top export to the UK is crude oil and its largest import is refined oil. May is on a trade mission in an attempt to bolster Britain's post-Brexit fortunes. This is her first visit to Africa since she became Prime Minister in 2016. The visit was part of her efforts to "deepen and strengthen partnerships around the world as the UK prepares to leave the European Union (EU) next year.